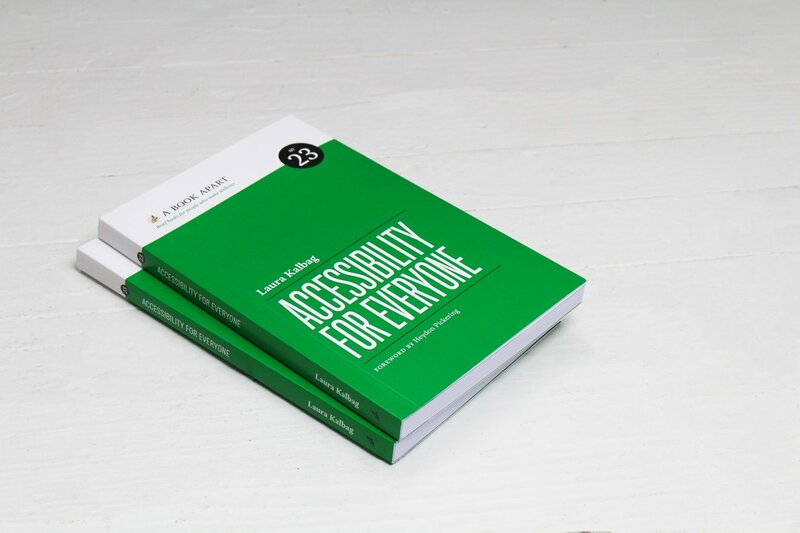 26 Sep, 2017 For the past three years, Laura Kalbag has been writing a book on accessibility. It’s called Accessibility for Everyone. You should read it. Many people with disabilities live in conflict settings or in developing countries, where they experience a range of barriers to education, health care and other basic services. In many countries, they are subjected to violence and discrimination. People with disabilities are also often deprived of their right to live independently, as many are locked up in institutions, shackled, or cycled through the criminal justice system. Many of these human rights abuses are a result of entrenched stigma and a lack of community-based services essential to ensuring their rights, including under the UN Convention of the Rights of Persons with Disabilities. To enable persons with disabilities to live independently and participate fully in all aspects of life, States Parties shall take appropriate measures to ensure to persons with disabilities access, on an equal basis with others, to the physical environment, to transportation, to information and communications, including information and communications technologies and systems, and to other facilities and services open or provided to the public, both in urban and in rural areas. With regards to communication technologies, the intent of Article 9 is reflected in accessibility legislation in the EU, US, and other jurisdictions for public (and publicly-available) services such as web sites. Such legislation is crucial to provide a baseline for access as well as the potential for recourse in cases of lack of such access. However, to fully grasp the role of accessibility, we must re-evaluate our understanding of the concept of disability itself. There is no such thing as disability. There are choices we make as a society which means that some people aren't able to fully participate in the world. We choose to have doors which are too narrow for a wheelchair to fit through. We choose to print text in a tiny font with low contrast. We choose not to include subtitles on our videos. It isn't that people need us to make things specially accessible - we need to not put artificial barriers in the way of [the people who use our products]. The web is pretty usable by default - it is up to us to keep it that way. The distinction between universal and accessible design is subtle but important. Accessible design considers the needs of people with disabilities. So, for example, accessible design might result in a building having a wheelchair ramp attached to its far side, as an afterthought. It might not be convenient for people using wheelchairs, and it’s unlikely to be used by people who find it faster to use the stairs, but at least there’s some form of access. On the other hand, universal design considers the needs of a diverse human population. Universal design might result in a building with a combined ramp and stairs, opening access to all and forcing no one to go out of their way to choose one option or the other. 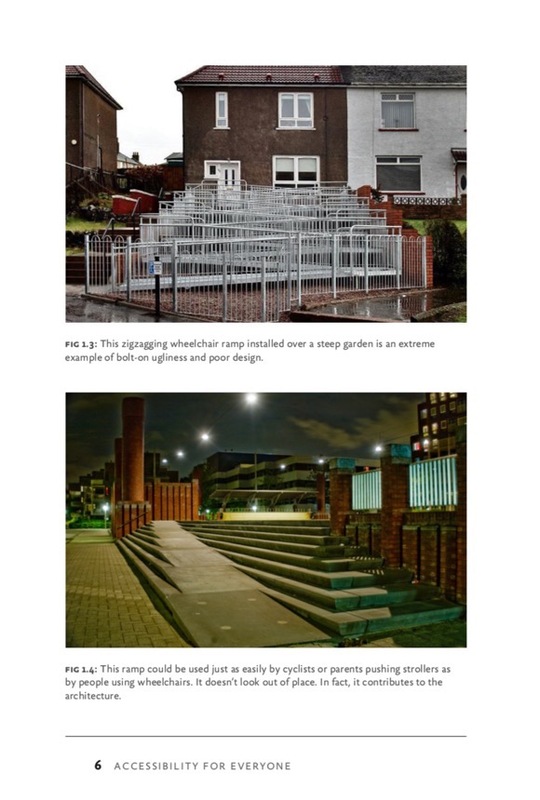 An example of accessible design (top) versus universal design (bottom) from Laura’s book. Accessibility is a human right. It is a prerequisite for social justice and a core tenet of ethical design. You’re out in bright sunlight, trying (and failing) to read a web site that has very low contrast. You are suffering because the web site is not accessible. You’re in a cafe and you left your headphones at home. You want to know what’s being said in a video you just saw online but you can’t as you don’t want to be “that person”. You are suffering because the video is not accessible and doesn’t have captions. 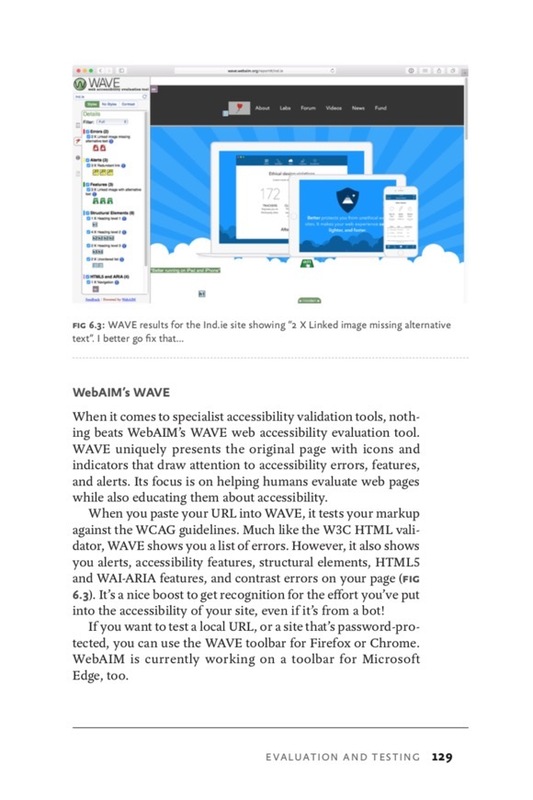 Accessibility for Everyone is peppered with pragmatic code examples and tool recommendations. You are trying to demonstrate your app at a conference and no one can read the text in the interface because it’s tiny and doesn’t scale. You (and the attendees) both suffer because your app is not accessible. 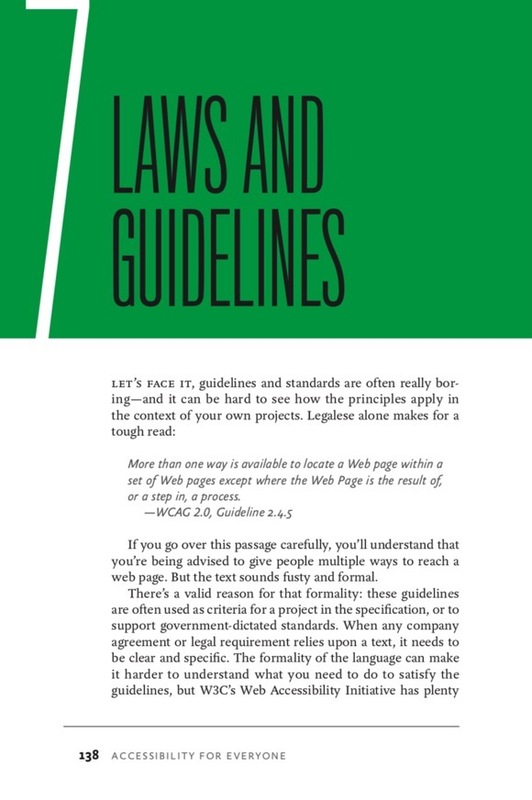 Laura’s book also contains a handy reference of relevant guidelines and legislation. Now imagine that the above scenarios where not ones you could easily fix (by walking indoors, borrowing a pair of headphones, scaling a screenshot of your interface in an image editing app, or sobering up). Imagine that these scenarios weren’t mere annoyances but permanent barriers. That’s the reality of the billion people worldwide who live with disabilities. Lack of accessibility effects your life negatively in a thousand tiny ways every day. For others, the effects are not so tiny and may represent considerable challenges, if not permanent barriers, to participating in modern life. Accessibility effects everyone. Accessibility is everyone’s responsibility. The sooner we understand this, the sooner we stop seeing accessibility as “someone else’s problem”, the sooner we realise that it is in all of our interests to understand the issues and tackle them in our own products, the sooner we make the world a better place for everyone. We need to work together to make and keep the web open, affordable, and available to all. Accessibility is our way to ensure that nobody gets shut out. 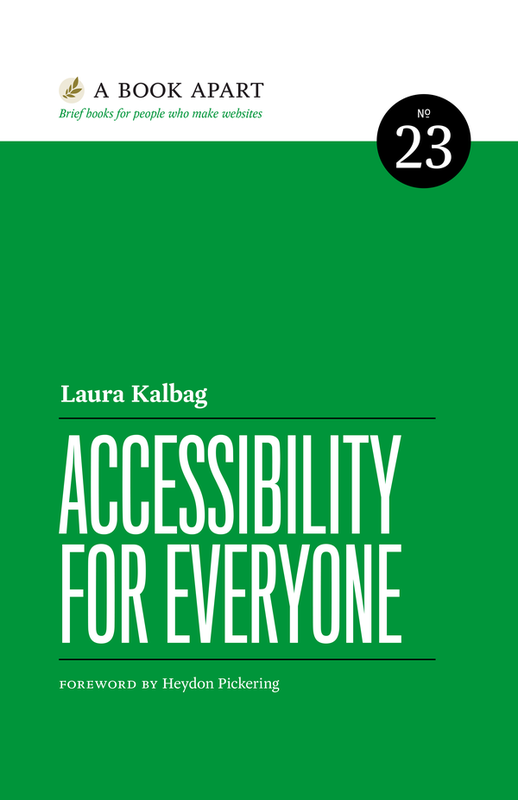 – Laura Kalbag, Accessibility for Everyone. 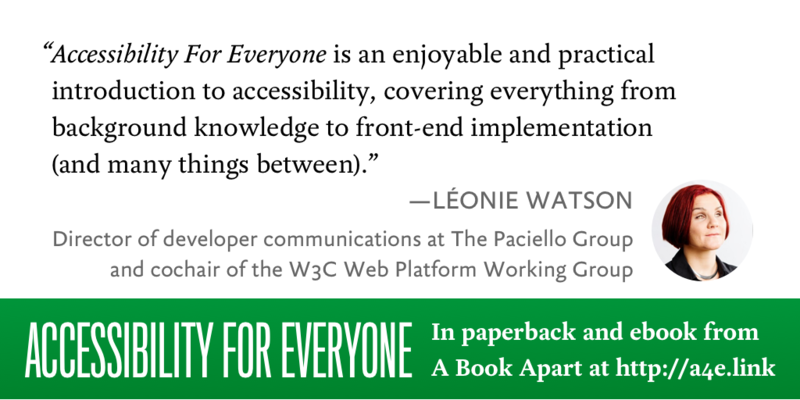 Accessibility for Everyone is a succinct, accessible introduction to web accessibility. It’s now available for purchase in both e-book and paperback format from A Book Apart.